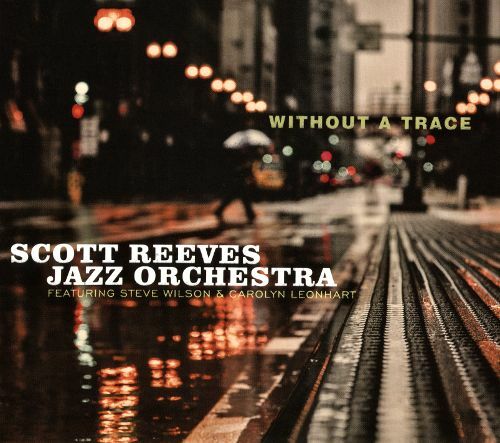 New York Big Band leader and composer Scott Reeves is someone whose music I wish I'd discovered sooner. His new release, Without A Trace, contains originals and standards, colourfully orchestrated and recorded with an intimate, club-like ambience. These pieces really are “composed”, and what a difference it makes. They are led by the line, so there is always a feeling of forward travel. No fewer than 12 soloists offer their artistry, including the composer himself on trombone and alto flugelhorn. Admirers of alto saxophonist Steve Wilson will be glad to find the band's sound shot through with his glorious, full-throated lead, making the diverting sax soli passages really sing. Take, for example, Juju. Wayne Shorter's '60s classic is re-imagined with the aid of Wayne's own recent revisions. Incandescence is a model of orchestral contrasts, moving between skilfully controlled, white-hot dissonance, to gentle repose and resolution. All or Nothing at All is perhaps my favourite, affording the sharp-eared some beautifully inter-woven cameos from Cole Porter and Horace Silver. The single vocal number Without A Trace is delivered with grace by Carolyn Leonhart, who is never overshadowed by the transparent, perfectly judged backings. It is hard for a British ear not to wonder at a Norma influence here, but she makes the song very much her own, and beautifully so. Speak Low, in a novel Afro-Cuban setting, repeatedly defies expectations with its uncoupled, free-moving sax lines and varied rhythmic variations. It engaged this listener throughout, as did the entire disc. I know who I'll be looking for in the New York listings on my next trip.